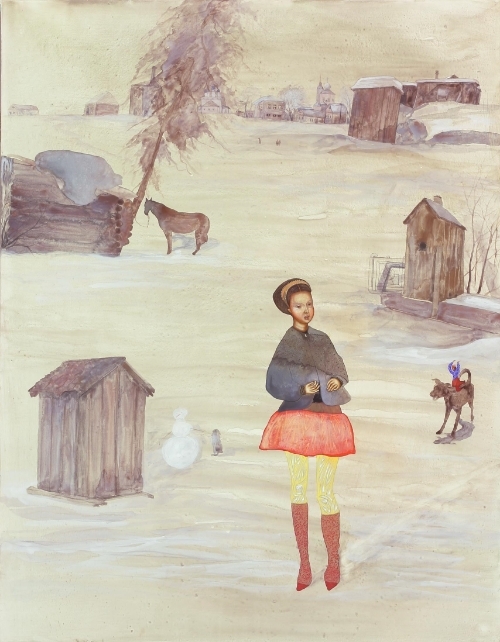 Made with traditional materials - pigments from ground semi-precious stones mixed with egg yolk and wine, and oak panels blessed in Russian monasteries - Veronica Smirnoff’s paintings hark from another era. Layer by layer, the textured surface is encrusted with paint and then sanded down to its sedimentary finish. Drawing on pre-Renaissance icon painting and Asian folklore, her wistful, fantastical, and richly evocative works appear allegorical yet evade narrative analysis, instead forcing us into an intuitive, emotive response. Veronica Smirnoff is a British artist of Russian origin, (born Moscow, Russia, 1979). She gained a BA from the Slade School of Art and a Post-Graduate Diploma from the Royal Academy of Arts. She had her first solo show with the Galleria Riccardo Crespi in Milan (2008) and has since exhibited in Moscow, Paris, Berlin, New York and London. She was selected for the John Moores Painting Prize UK in 2010. "An abiding sense of art history is ever present in my work ... I have always been interested in the construction of the iconic, the “Icon” as the object of worship and its relationship to “popular art” with a wide repertoire of signs: the flat moulding of figures, schematic linearity and cut-out two-dimensional quality, the abstract effects of colour, flatness and tilted depth. There’s nothing accidental about its inner logic - the sensitivity to relative positions of objects in a visual composition and expressive use of lines; iconographic registers are all about what’s signified and how."